Researchers use tracking systems to create an infinite labyrinth that can fit in a single room. 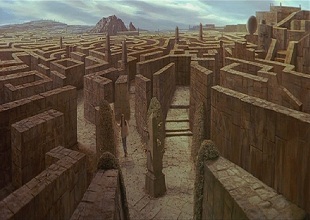 Some of the worst dreams I've ever had have been of being trapped in a maze. I'd turn corner after corner, finding nothing but dead ends. Every step I made toward escaping would promptly be reversed by my apparently sadistic subconscious. Now, thanks to the wonders of virtual reality, I can live out my nightmares in the waking world. Researchers have developed a VR system that can create massive mazes contained inside a single real world room. The new maze system, recently presented at the IEEE Virtual Reality conference, uses technology that tracks the user's movements and position in the room to create a network of corridors and rooms that never move outside the confines of the actual physical space. Test subjects can literally be walking in circles while the VR creates the illusion of interconnected environments. "People think they are walking in much larger environments. We can simulate rooms connected by corridors, and we could simulate outdoor areas in which certain areas are restricted," said Hannes Kaufman, a researcher from the Vienna University of Technology. The system isn't unbeatable. Attempting to use it while walking on a treadmill, for instance, wouldn't work. That said, some things from the real world can be used to bolster the illusion. At several points in the testing process, researchers tried telling users to try walking through a virtual wall while standing near a physical one in the real world. Upon bumping into the real wall test subjects treated the virtual ones more realistically from that point on. Impressive as the technology is, there is still progress to be made before it can be put into any sort of practical use. Currently, the program only allows for one user at a time. Its designers want to expand to include a second person and then more following that. Kaufmann hopes that this technology could eventually be used to help simulate museums and similar environments in the comfort of a person's home. "In the morning you could walk into the Guggenheim and in the afternoon explore the Taj Mahal."